You may disagree, however it is not necessary to burn your home down in order to get rid of spiders. I know, I know…most people would be perfectly happy to go to such lengths to get rid of spiders. But I will tell you, there is an easier way to get rid of spiders. Creepy Creatures understands that in order to get rid of spiders, you have to get rid of what they are eating. Unlike many insects that will scavenge on food, wood, glue and such, spiders only eat other living things…so the key to getting rid of spiders is to find the insects they are feeding on and exterminate those bugs. Whether it is roaches, ants or some other bug they are feeding on, we will find them! Creepy Creatures Termite and Pest Control always provides Free estimates and consultations! Dusty Showers, owner of Creepy Creatures Termite and Pest Control lives in Palm Harbor and loves to serve Palm Harbor and the surrounding areas. 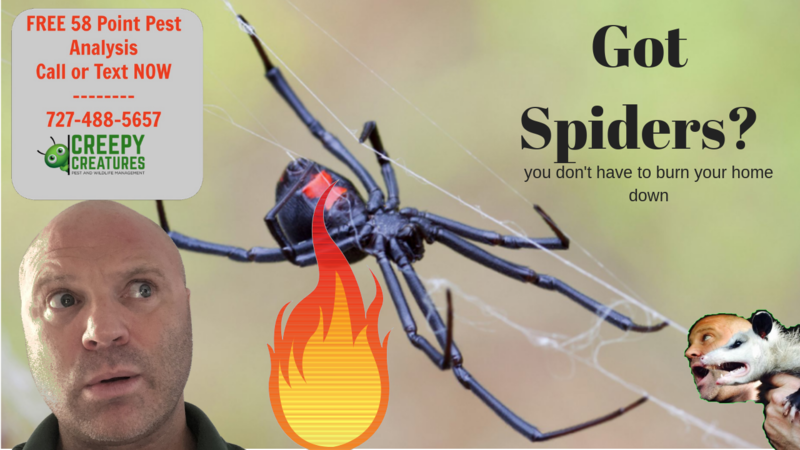 Whether you think you have black widows, brown recluses, wood spiders, wolf spiders or any other spider, Creepy Creatures can get rid of your spiders. When trying to get rid of spiders, you do not want to waste time and products “spraying for spiders”. Creepy Creatures, does a thorough 58 point pest analysis to get to the bottom our your spider issue!